Be the first to share your favorite memory, photo or story of John "Bill". This memorial page is dedicated for family, friends and future generations to celebrate the life of their loved one. Mr. John “Bill” Edward Leverette, age 90 of Powder Mill Street, Dallas, Georgia passed away Monday, November 5, 2018 at his residence. 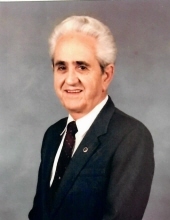 A son of the late Ross D. and Ora Lee Edwards Leverette, he was born November 4, 1928 in Eufaula, Alabama, having lived a greater part of his life in Toccoa and Marietta and the last 12 years in Dallas, Georgia. He was a Veteran of the U.S. Air Force, retired from Lockheed Corporation, a member of Fortified Hills Baptist Church and member of the Masonic Lodge. In addition to his parents, he was preceded in death by his wife, Jean Looney Leverette in 2012. Survivors include two daughters and son-in-law, Janice and Scott Barfield of Dallas, Georgia and Judy Moss of Richmond, Virginia; grandchildren, Michelle Farmer and husband Ryan, Sarah Gwaltney and husband Micheal, Kitty Moss, Jessica Moss, Amanda Moss, Johnny Barfield and wife Kristen, Christopher Barfield and wife Amelia; great-grandchildren, Michael, Lainey and Abby Farmer, Micheal, Sam and Ben Gwaltney, Dylan, Donovan and Layla Moss, Amya Pace, Savannah Ramos, Sage Moss and Lilianna Cruciata, Riley Barfield, Weston and Paisley Barfield and Rhett Barfield; brother and sister-in-law, Frank and Terri Leverette of Jacksonville, Florida; two sisters, Sue Leverette of Decatur, Georgia and Josephine Rentz of Hampton, Georgia. Cryptside service will be Thursday, November 8, 2018, 4 O’clock p.m. at the Stephens Memorial Mausoleum with The Reverend Josh Price officiating. The following gentlemen will serve as pallbearers, Johnny Barfield, Chris Barfield, Ryan Farmer, Michael Farmer, Micheal Gwaltney and Sam Gwaltney. The family will receive friends at the Acree-Davis Funeral Home on Thursday, November 8, 2018, 2:30 p.m. until time to leave for the service. Online condolences can be left for the family at www.acree-davisfh.com. Entombment will follow in the Stephens Memorial Mausoleum with Military Honors by the U.S. Air Force Honor Guard and the V.F. W. Post 4346 Honor Guard. Acree-Davis Funeral Home is in charge of the arrangements for Mr. John “Bill” Edward Leverette. To send flowers or a remembrance gift to the family of John "Bill" Edward Leverette, please visit our Tribute Store. "Email Address" would like to share the life celebration of John "Bill" Edward Leverette. Click on the "link" to go to share a favorite memory or leave a condolence message for the family.